Broadcast journalism in particular is an area where engaging data visualizations can be the difference between a ho-hum story and a captivating segment. All types of reporting, from investigative pieces to stories about politics or sports often include various data points and come alive when presented using highly interactive data visualizations. News organizations are also noticing that their audiences expect an opportunity to engage with the stories on more than one platform to get more information. So in addition to on air broadcasts, organizations often make information available online and via mobile apps for viewers to better educate themselves. Being able to deliver compelling insights both on screen and online is key to the success of the leaders in broadcast journalism around the world. Recently Microsoft has been working with KING 5 News to bring this form of data storytelling to the local level in Western Washington. KING 5 News, a multi-platform media company and NBC affiliate based in Seattle, started working with Power BI for their Super Tuesday coverage in early March. 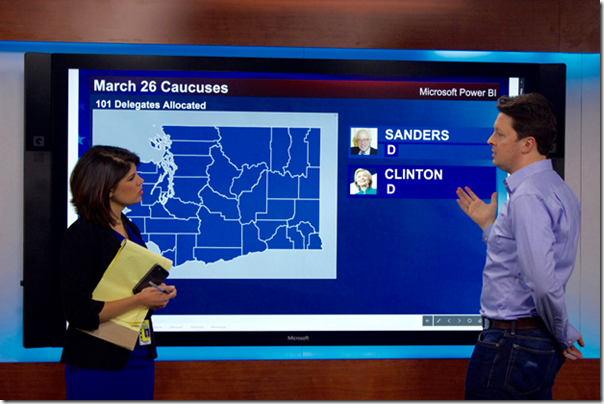 With the first in-studio Microsoft Surface Hub unveiled in February, KING 5 News has an interactive and group collaboration device powered by Windows 10 that lends itself as a helpful way to showcase election results coverage in real-time to eager viewers at home. It has been exciting to work with KING 5 News to showcase data analytics on the Surface Hub in a compelling way for KING 5 News viewers. After the success of the Super Tuesday report, KING 5 News decided to utilize Power BI again to report on the May 24 Washington presidential primary results. This time around, the Power BI report will showcase more data for increased interactivity with a county-by-county breakdown of votes for both the Republican and Democratic parties, including Republican convention delegate allocations. We worked closely with KING 5 News to design a report to meet the branding needs and functionality required by a leading media company in the region. KING 5 News is using Power BI to create a report with visualizations to help them tell the story of the election tailored to a TV broadcast. The report has to stay up to date as data is uploaded from sources like the Associated Press and the Washington State Secretary of State’s office. The data is loaded into an Azure SQL Database and into the report using our Direct Query technology. One critical aspect is ensuring KING 5 News’ reporters have a top notch presentation experience on camera. In addition to touch capabilities, we added a new Surface Hub presentation mode available in the most recent release of the Power BI Windows Store application, which provides support for inking using the Surface Hub pen and streamlined presentation controls to help tell stories during presentations. This is a critical component to KING 5’s storytelling capabilities, as KING 5 News’ reporters can now use Surface Hub’s pen to fluidly make notes on the report so viewers clearly identify important insights. This already would have been quite a compelling use of Power BI, but we wanted to do more. So we are using the Power BI publish to web capability to add the same report used on air to KING 5 News’ website and KING 5 News’ Android, iPhone and iPad mobile apps. This second screen experience allows KING 5 News to provide engaging election coverage beyond the studio, something very unique at the local level in broadcast journalism. The results provide a new level of election reporting detail delivered from a local television station, viewers can watch the broadcast or interact with the publish to web version of the report on www.king5.com or in the KING 5 News mobile apps to discover how their votes fit into the overall election results. This project came about given KING 5 News’ involvement in the new Microsoft Power BI Data Journalism Program. The program provides a custom experience for press and influencers that includes education, training, guidance and support to help produce engaging data stories that allows others to explore information in a captivating way. Make sure to visit www.king5.com shortly after 8 p.m. tonight for a first look at the results and tune into KING 5 News starting at 8:30 p.m. for primary night coverage to see how your votes play into the bigger election picture.